British sound specialists Bowers & Wilkins have collaborated with iconic Italian car brand Maserati on a special Maserati Edition of their P5 Mobile Hi-fi headphone. P5 headphones deliver a wonderfully natural sound on the move, and a luxuriously comfortable fit that makes longer listening sessions a pleasure. Paying homage to the design heritage of both brands, P5 Maserati Edition is crafted from fine-grain natural leather in Maserati’s distinctive deep racing blue and features the iconic Maserati Trident emblem. 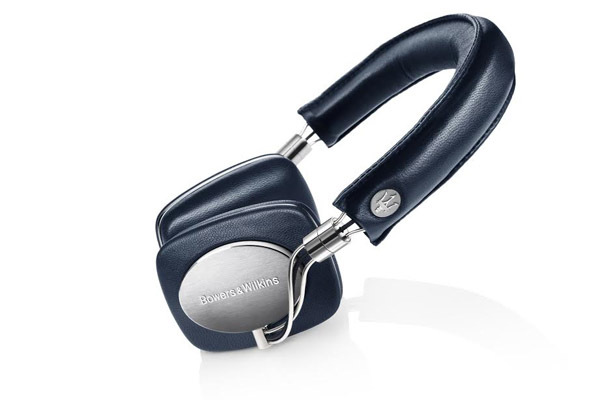 The headphones come with their own protective travel case, also in Maserati blue leather. Maserati and Bowers & Wilkins share a commitment to engineering excellence, technological innovation and true performance. Both brands are renowned for their luxurious attention to detail and use of premium materials and the limited edition Maserati P5 headphones epitomise these values. To celebrate the launch of the P5 Maserati Edition Bowers and Wilkins are running a Twitter competition in which they are asking people to share their favourite sound partners. The competition will run for three weeks from 17th January - 7th February 2014. Bowers & Wilkins will select their favourite answer each week and the winner will receive a pair of P5 Maserati edition headphones.